NAIROBI – Kyadondo East MP Robert Kyagulanyi Ssentamu, aka Bobi Wine, on Wednesday, arrived in Kenya ahead of celebrations to mark Moi Day. 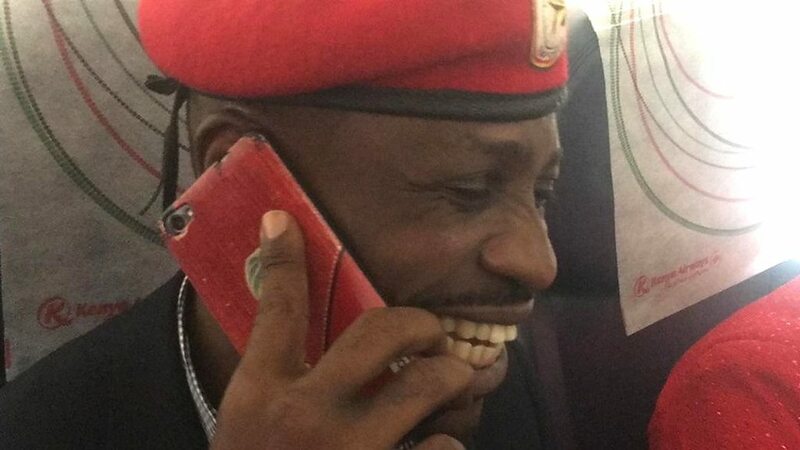 Bobi Wine, who touched down at the Jomo Kenyatta International Airport at 6 pm, is in Nairobi at the invitation of Kenya Young Parliamentarians Association. Comrade @HEBobiwine will be visiting Kenya in response to an invitation I extended as Secretary General of the Kenya Young Parliamentarians Association out of profound respect for the role he is playing in inspiring young people across the continent. The MP is leading a delegation of youthful Members of Parliament from Uganda. The legislator will be interviewed on Citizen Television’s Jeff Koinange Live later on Wednesday night. Kenyan politician and legislator Babu Owino took to Twitter to announce the development. “I wish to take this opportunity to announce to the nation that the Hon Robert Kyagulanyi/ @HEBobiwine will be leading a delegation of young Ugandan Members of Parliament to Kenya this Moi Day, Wednesday, October 10th, 2018 for a five-day official visit,” he said. Cde @HEBobiwine and his deligation from Uganda, together with the Kenya Young Parliamentarians Association, will engage with the university student community, the civil society, young grassroots community leaders and the Press. Kenya Young Parliamentarians Association invited Bobi Wine “out of profound respect for the role he is playing in inspiring young people across the continent”. Moi Day is in honour of former Kenyan President Daniel Moi. This year, the Government of Kenya has chosen to follow last year’s court orders to recognize the day and gazette it as a public holiday. “President Museveni’s time is up. He is the last of Africa’s dictators and he must go. Bobi Wine is innocent, they are using him as a scapegoat. He is not just a person but an idea. He represents the 75 per cent of youth who make up the population of Africa,” activist Boniface Mwangi said during the protest.